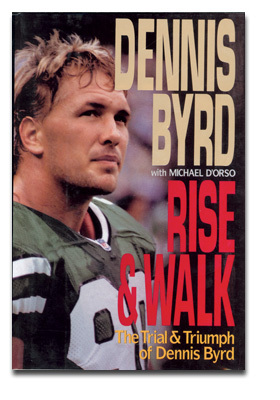 From Library Journal: Byrd, a defensive lineman for the New York Jets, was paralyzed from the neck down in a collision during a game in November, 1992. This book provides a full autobiographical treatment of the 27-year-old Byrd, but its essence is a graphic, arresting description of the physical and emotional devastation he experienced from the moment of impact to the present time. The strenuous work undertaken during his recovery is detailed, as are Byrd's spiritual reflections. In a matter of months, Byrd defied all predictions and reasonable hopes and began walking again. He relates the role played by his wife, family, friends, doctors, therapists, and the general public; a combination of "medicine and miracles, of divine love and human faith and, yes, of endless hours of sweat, and pain and tears." This is a very moving and inspirational title.